ALEKO awning 10 x 8 feet is the first choice for most home owners who choose a manually-operated mode. This model requires no electricity. It opens and closes easily in less than a minute, using a simple hand crank that operates smoothly and quietly. 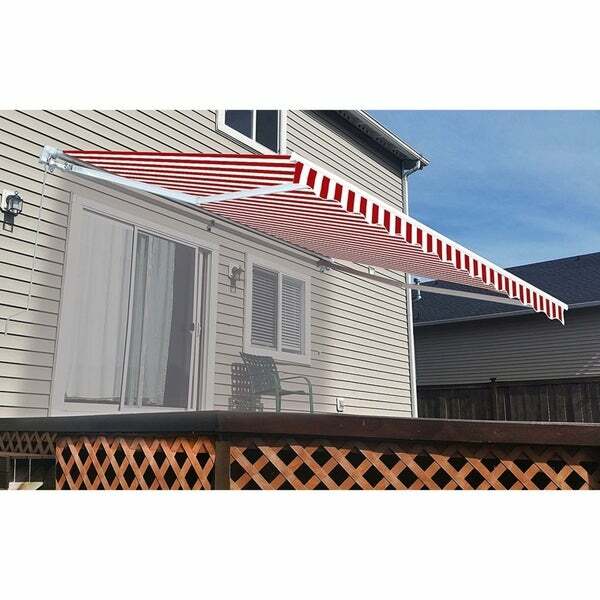 Optional accessories feature support arms that can be positioned vertically on the patio floor, or angled back against your house wall to provide better fabric tension and overall stability. Another usefull optional part is a ceiling mounting bracket to attach your awning to the roof overhang of your house. The fabric provides coverage and protection from the elements. All awnings come with pre-drilled holes to make accessory attachment a breeze. Includes wall mounting brackets for installation, additional ceiling bracket sold separately.